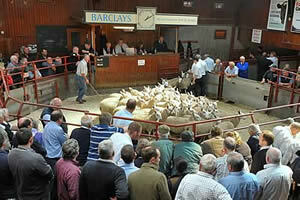 The Cumberland & Dumfriesshire Farmers Mart had forward 4,269 Store Lambs and Feeders at their Weekly Sale at Longtown on Tuesday 29th November, 2011. Another fine show of lambs attracted plenty of customers, trade was again excellent. Top of £95.50 for Texels from Bettyknowes, £92.50 Romanway, £84.50 Enzieholm; Suffolk £86.50 Milnholm, £83.50 Gospel Hall; Beltex £80.50 Old Hall; Greyface £78.50 Ouston and Bayldon, £76.50 Blakelaw, £75 Peterhouse; Shropshire £77.50 Birchcraig; North Country Cheviot £74.50 East Murton, £71.50 Hownam Grange; Lleyn £74.50 Lustruther; Cheviot Mule £71.50 Southdene and Priesthaugh; Blackface £70.50 Laverhay, £67.50 Heugh, £66.50 Bennettfield; Kendal Rough £68.50 Low Northsceugh; Herdwick £67 Stackbraes; Swaledale £58.50 High Edges Green, £54.50 Blindburn. Cheviots (638) less forward but trade still dear. Top of £70.50 Whitslade. East ewes to £83 The Ash, hill types £75.50 Southdene, cast rams £100 Newton.